Avalon Bay AB-WINE12S Single Zone Wine Cooler The Avalon Bay AB-WINE12S Single Zone Wine Cooler is a state-of-the-art wine cooler designed for home use. Small, compact, and freestanding, the AB-WINE12S provides quick and easy access to your wine. It can hold up to 12 bottles of wine and the temperature can be adjusted to accommodate either red or white wine. The thermoelectric cooling system keeps it perfectly chilled and it comes with a special LED light that showcases your wine for your guests. 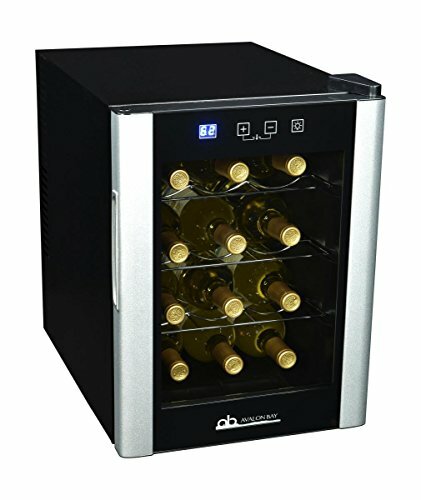 If you're a devoted wine lover who enjoys a nice glass of wine with dinner, but lack the space for an enormous wine cooler in your home, then the Avalon Bay AB-WINE12S is the perfect wine storage solution. Special Features Single Zone Cooling Adjustable 51° - 64° Temperature Range Silent Thermoelectric Cooling System3 Removable Chrome Shelves Stores 12 Standard Size Bottles of Wine Blue LED Light Temperature Control The Avalon Bay AB-WINE12S uses a thermoelectric cooling system to age your favorite vintage wines at ideal storage temperatures. The system can not only be set for any temperature between 51° and 64°F. It is also completely silent and vibration free, so nothing will disturb your wine while you store it. The temperatures are monitored and controlled by an LED display at the top of the cooler. It tracks the temperature of the cooler and allows you to adjust the temperature up or down using the clearly-marked push button controls. 12 Bottle Storage Capacity The AB-WINE12S weighs only 24 pounds, but can hold up to 12 standard size wine bottles. It comes with three chrome shelves. Each one can be completely removed in order to accommodate larger wine bottles. Sleek Design The Avalon Bay AB-WINE12S has a sleek, black and steel design that complements the look of any room it's placed in, whether it's your kitchen, home bar, living room, or wine cellar. There is a blue LED light at the top of the cabinet that illuminates your wine and adds a touch of class, transforming your wine cooler into an elegant display that enhances the look and feel of your home. Cooling System: Quiet and vibration free thermoelectric cooling system allows you to set the temperature as low as 51 degrees Fahrenheit and as high as 64 degrees Fahrenheit and protect sediment. Adjustable Shelves: 3 chrome plated wire shelves pull out to make for easy bottle loading when needed. If you have any questions about this product by Avalon Bay, contact us by completing and submitting the form below. If you are looking for a specif part number, please include it with your message.